Project Manukau was one of New Zealand’s largest construction projects, and involved a major upgrade of the Mangere Wastewater Treatment Plant and the rehabilitation of coastal foreshore. Boffa Miskell was part of the Project Manukau team when the treatment ponds were removed from within the Upper Harbour and the Treatment Plant was developed to improve the quality of Manukau Harbour and the foreshore. In this BNR ( Biological Nutrient Removal) upgrade and expansion project we worked with the engineers to establish the road alignment to maximise views over the Upper Manukau Harbour, developed a landform to screen the expanded plant from neighbours and a path to provide a new link between sections of the Project Manukau paths. The strength of this expansion project is the reconciliation of the seemingly incongruent land uses of public open space, with the provision of technically advanced wastewater treatment and ecological habitat. 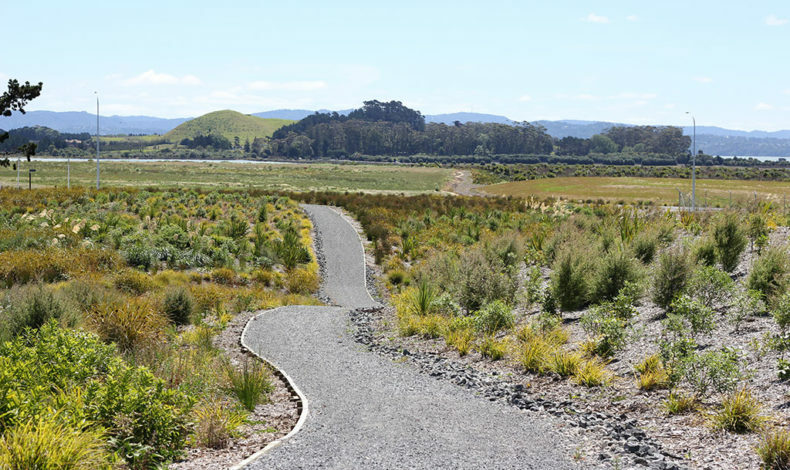 In such a potentially sensitive area, both ecologically and visually, the project team built upon the successful foundations of Project Manukau, whilst looking to provide a link to the future Regional Park network in the Manukau Harbour. Extensive native planting of eco-sourced plants was undertaken to naturalise the areas and tie the new areas in with the earlier plantings. The paths are now part of the Te Araroa Trail. Working as a sub-contractor to Beca, our multi-disciplinary team provided landscape planning, landscape and visual assessment, ecological assessment, consenting services, landscape architecture, and after the landscape works were tendered, we supervised the implementation of the paths, furniture and signage, as well as the extensive planting. What makes this project unique is the combination of highly complex wastewater treatment processes and Boffa Miskell’s team of landscape architects who built on the ethos developed in their work on Project Manukau, from 1998 -2004, to tie the expanded plant into the public open space earlier developed. The outcome is a project in which wastewater treatment processes and landscape architecture have combined to improve the quality of Manukau Harbour and the foreshore – increasing public use and enjoyment of one of New Zealand’s best natural harbours and the Te Araroa Trail.